British Airways has launched its own Chinese New Year event, and it is a very attractive one. As long as two people travel together, you can fly from Heathrow to Beijing or Shanghai in Club World for just £1009 each (£2018 for two). There is even a way of getting the price below £1000 each as I show below. In typical BA style, this deal is not being shown on the ba.com home page or the special offers page. Neither have they emailed the public or trade partners like us about it. The fare is definitely there though! Remember to search for TWO Club World passengers. Last year you may remember I wrote about our own visit to Beijing at Easter. We did not require a Visa to get in because we were technically in transit – we flew in from Tokyo and flew out again, three days later, to London. You DO still require a Visa if you fly into China and it is your final destination. My review of the impressive Waldorf Astoria Beijing is here. 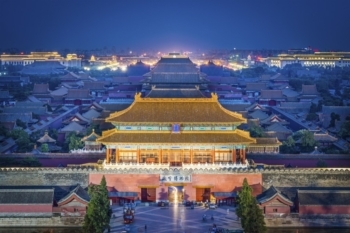 It is a very smart hotel and, importantly, only a few minutes walk from the Forbidden City. That said, if it is a toss-up between Beijing and Shanghai then I think the latter is more interesting. These British Airways Club World deals need to be booked by Wednesday 21st. You can also book these deals via BA Holidays via this page. Search for ‘flight and hotel’ and various options for two people for a similar price as the flights (£2018) or even less will appear. For example, for a 3-night stay from 16th to 19th June, I can book 2 x Club World flights to Shanghai PLUS three nights in the Rayfont Hotel South Bund (3-star, admittedly) for just £983 per person! BA Holidays bookings earn Avios and tier points as usual on the flights, although they do not earn credit in the BA On Business small business loyalty scheme. It is worth playing around on the BA Holidays site to see what comes up. Now cancelled our LHR/PEK avios redemption with 241 in first and took the Club World offer LHR/PEK PVG/LHR, used 31,000 part pay to save £240, not the best value for the Avios but we will be earning 40,000 avios plus tier points with the new flights that we wouldn’t of earned with the reward flights, so not bad. So we can save the refunded 241 and 170000 avios for another time! You can also book this flight for £884 per person if you do a Kayak search! Wanted to book Manchester to Beijing in September but not in the offer so it’s £3012.52 per person.No special price.London to Beijing same flight and same date £1008.01 per person.Could book Manchester flights separately for £122 economy or £200 business but have to collect baggage at Heathrow and check in again.Rang exec club but no chance of ticketing bags through.Scandalous discrimination against the regions .Our national carrier is a national disgrace allowing such things to happen . It’s true but there are many deals which work from the regions only too. For that sort of saving isn’t it worth doing? Just one of the travelling party need to collect and re-check, don’t take anything but passport/phone landslide and you’ll have fast track security to get back through very quickly. Worse than that – if you check EDI or GLA for the China discount, you will find two connecting fares discounted – but only flying through LGW or LCY – so airport transfers are being forced on those of us outside London to get the deal. It’s not as if the LHR flights are full (the EDI 10am flight is almost always a 767 wide body) but LHR connections are showing full fare only – Computer says no – BA is simply not extending the sale to the regions/nations….Of course you can collect bags and recheck on another PNR, but that’s no way to treat customers outside London….Poor show….. Even more scandalous, I can’t book from Birmingham at any price, or Bristol, Norwich, Cardiff etc. can you use avios to book these flights ? You can part pay, yes. Kayak brings up these BA Club flights with Traveltrolley or TravelUp for around £900 per person. Any disadvantages for booking this way? you have to pay right away.. No cooling off. No 72-hour hold. no deposit and pay later. If I book flight and 1 hotel night as a holiday booking. Can I subsequently cancel for a full refund? i.e are the tickets booked in to a flexi class? What I honestly don’t know is whether you can walk away from your £300 deposit with no liability to pay the balance. Would be interested in knowing the answer to that. Is this booked BY 21st. i.e end of day on the 20th. or end of day on the 21st? RESERVATIONS MUST BE MADE ON/BEFORE 21FEB 18. 21st marks the end of the CNY national holiday. Well I booked at 12:40 hours Hong Kong time on Wed 21FEB and everything went through fine. This is 04:40 hours UK time. So assume the offer is valid till midnight UK time on Wednesday 21FEB. So one needs to move on and book if interested rather than leaving it till the last minute! Better to book a holiday including flight and hotel with a £300 deposit per booking. This is non refundable and the balance to be paid by 20 AUGUST. The balance to be paid 5 weeks before departure. Sorry for any confusion. Thanks for this Rob. Booked two weeks in October. I managed to book the flights at this excellent rate. Do we know it is possible/ worth adding hotels to the same booking? You can’t turn it into a BA Holidays booking once the flight is already booked unfortunately.